Recently I’ve been starting PD sessions by asking teachers to engage in what Harvard’s Project Zero calls a “chalk talk.” A chalk talk asks participants to consider a question then silently write down their ideas about it, without talking to each other. Then once they’ve gotten their own ideas down, they’re invited to respond to others—again, without any talking. 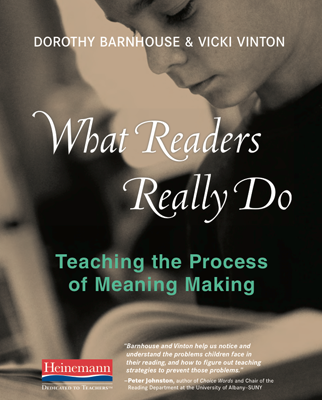 Yet often, in their classrooms, these same teachers spend much of their time teaching discrete skills, standards and strategies that, in and of themselves, may never touch on these deeper reasons for reading. To be clear, this isn’t always the fault of teachers. Many schools use packaged or scripted programs, which they require teachers to implement “with fidelity,” and the lessons in those programs are mostly framed around discrete strategies, standards and skills. And in schools that aren’t using packaged material, teachers are often expected to write a specific outcome in the classroom each day—often presented as an “I can” or “Students will be able to” (SWBAT) statement—and then assess who’s met the outcome, or not, by the end of the period. Inevitably, what this does is narrow the door for readers in a way that can give them a warped view of reading—and it prevents us from seeing all they might be capable of. To see what I mean, let’s imagine two groups of students both reading the following passage from Patricia Reilly Giff’s Fish Face, which is a Fountas & Pinnell level M book. One group is being asked to identifying character traits, a commonly taught skill, while the other is reading the passage more holistically to consider what it might mean in a broader way. When asked to identify each character’s trait, many students will read this passage and conclude that Emily is nice, friendly or kind and that Dawn is shy. In each case, they’d be able to support these conclusions with evidence from the text: Emily is nice because she wants the new girl to sit next to her and says friendly things, like “You have a pretty name,” while Dawn is shy because she’s a new girl and doesn’t always respond to Emily. They might meet the outcome on the board by doing this, but they’d be missing a lot. I’ve seen many, for instance, who miss the fact that Emily has lied to Dawn because, having already identified a trait, they think their work is finished. And by missing that, they also miss the chance to engage in meaningful reasons to read: to realize how complex people are. Now, let’s see what can happen if we opened the door wider and set the task, not on practicing a skill, but on exploring what the writer might be trying to show her readers. And let’s say we do this in a way that encourages students, not to rush to make claims, but to consider multiple possibilities. Those students might think that Emily could be nice, kind and friendly and also envious, while Dawn might be shy but also mean or snooty. Many might also consider that envy could lead to lying, which would help them understand that people are complex—and might make feel understood and empathetic. So how do we open the door wider to give students more room to engage in deeper thinking and reap the real benefits of reading? While standardized tests are all about answers, reading is an act of meaning making, and the first thing we need to do is shift our focus from looking for answers to thinking. To do that, we need to be, as Walt Whitman once said, “curious, not judgmental.” That means not hopscotching from student to student until we get the answer we’re seeking, but accepting a wide a range of thinking—not to debate, but to consider. It also means honoring provisional thinking, which uses words like might, could and maybe. After all, the only way to really know what’s going on with the characters in Fish Face is to suspend judgment and keep on reading with these possibilities in mind, revising your ideas as you go. I’m often in schools that want teachers and students to use academic language because, after all, they’re in school and that language will be on the tests. Much of that language, though, consists of abstract words connected to abstract concepts, like theme, and while we can teach students to use this language, it doesn’t mean they really understand it. Take, for instance, the small group of fourth graders I used the Fish Face passage with. Like our second group, they inferred up a storm, though they hadn’t explicitly been asked to. After they’d shared their thinking, though, I asked them—in front of all the fourth grade teachers—if they knew what the word inferring meant. To their teachers’ dismay, some said they’d never heard it before, while others said they’d heard it, but couldn’t remember what it meant. But finally, a boy said he knew what it meant: reading between the lines. “Ah,” they all said, now they got it. 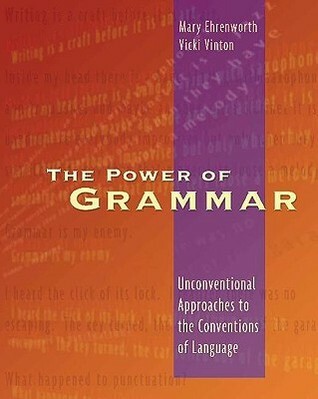 What they needed was an experience and a concrete example drawn from their own thinking to attach the abstract word to. In our current climate of teacher evaluations, accountability measures and mandates, trust is often in short supply. And I’m aware that some teachers are afraid that, if they open the reading door wider, they’ll be seen as not doing their job. 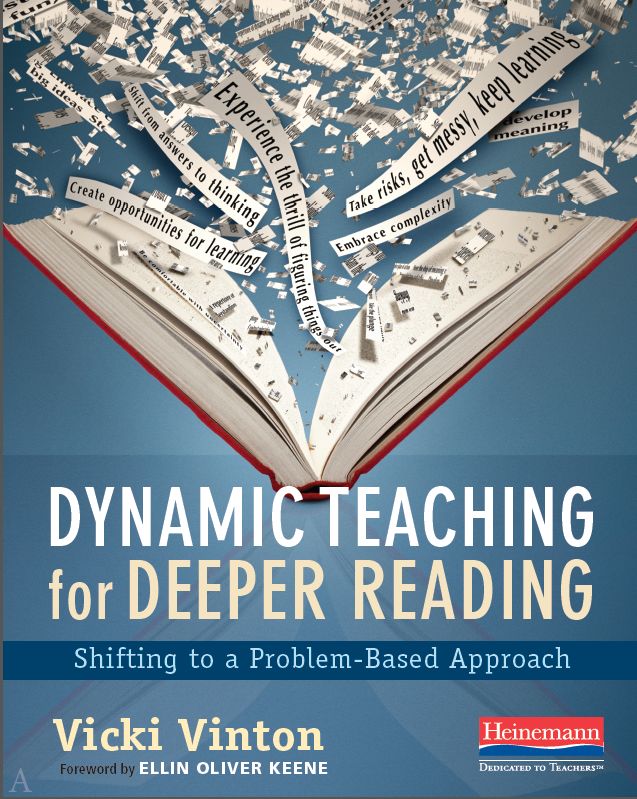 When we open the door wide enough for students to engage in real meaning making—which involves continually revising your thinking and considering multiple possibilities—the strategies and skills we can belabor often seem to magically appear. Like the fourth graders, students reading for meaning often infer at higher level than students who are charged with practicing a skill. Also, the claims students reading for meaning make tend to be more nuanced and complex than those of students reading to identify a trait. And when it comes to standardized tests, they’ll be ahead of the game. Instead of starting to think once they’ve read the passage and get to the questions, they’ll be thinking from the very first sentence. Finally, when we open the door wider, we create enough space for students to feel the power of reading to help them better understand themselves, other people and the world around them. And if those chalk talks are any indication, that’s just what we want to happen.